At first glance, this vision of the future looks like something out of a novel by Jules Verne... except that it dates from 1829, when Jules Verne was only a year old! 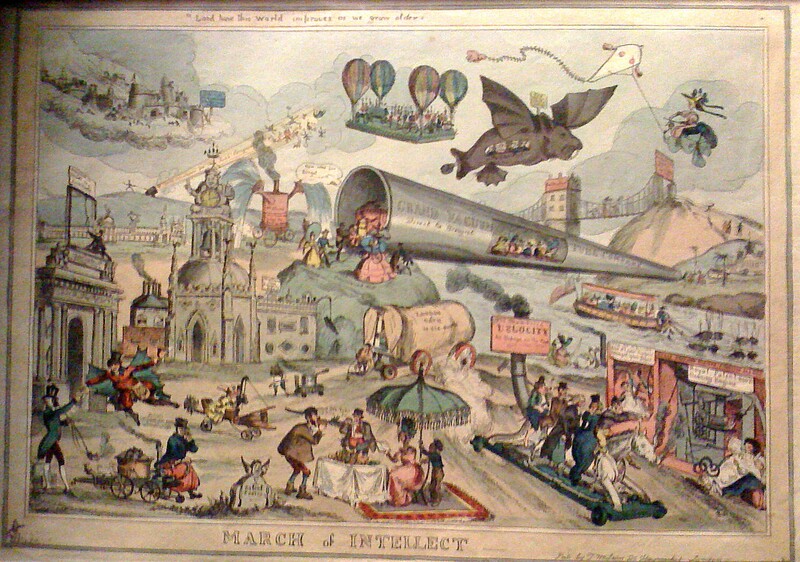 Entitled March of Intellect, this is one of several works by the satirical artist William Heath (1795 - 1840) on display in the British Museum. The drawing is one of the earliest I've seen which focuses predominantly on technological inventions as a mark of progress... and it's really quite remarkable given that it dates from a time when the only overland modes of transport were balloons and horse-drawn carriages! The first steam passenger service (the Liverpool to Manchester Railway) was still a year in the future, while the first dirigible airship was more than 20 years away! The most striking feature of the picture is the metallic tube into which passengers are embarking. The wording on this (which is not very legible in my photograph, I'm afraid) says "GRAND VACUUM TUBE COMPANY: Direct to Bengal". Assuming the starting point is meant to be London, this is a distance of seven thousand miles! Presumably Heath's idea was that the passengers would sit in a tight-fitting capsule, which would then be forced along the tube at high speed by atmospheric pressure... rather like a more advanced version of Brunel's Atmospheric Railway in South Devon, which opened in 1847 (and shut the following year, because it didn't work very well). Other interesting points in the photo are the "city in the sky" (top left hand corner) and the hill below it. Is that supposed to be a cannon firing people into the sky? Or are they travelling upwards on a beam of light? ?